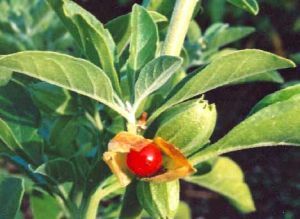 Ashwagandha is a shrub and is biologically known as Withania somnifera. It is generally found everywhere in India especially in northwestern part, but is now a days cultivated in fields because of its great commercial demand. The plant size is about 1 to 5 ft and the part used is root. It was being named "ashwagandha" because its root smells like horse and it itvitalizes body to provide strength just like a horse possess. It is a natural herb to support healthy brain function and manage daily stress. It works in relieving pains of any kind in human body. It possess this property due to its ushan virya potency, which helps in eradicating vata that is the reason of initiation of pain in body. Relieves from the feel of numbness and burning sensation. Provides nourishment to the brain for proper functioning. Helps in curbing mental and physical weakness like vertigo, unconsciousness, and depression. Improves mental ability and concentration. Revitalizes body and decreases untimely fatigue. Works as a rasayan that helps in preventing early aging and rejuvenates whole body to provide youth. Works as powerful immune booster. Builds up stamina and muscular endurance. A powerful aphrodisiac thereby enhances the sexual powers and long lasting endurance. Increases sperm count and its quality. Gives good results in leucorrhoea, as it possesses the properties that finishes kapha. Helps in stress related disorders like premature aging, hypertension,arthritis, and diabetes. Provides strength to heart muscles and keeps heart working normal. It behave like a diuretic therefore helps in treating urinary tract infections (UTI). Helps in recovering from long illness as in case tuberculosis or surgeries. Good results have also been seen in upper respiratory tract infection (URTI) and in asthmatic condition with wonderful results. Its crude powder is hard to digest and can cause heaviness in abdomen and flatulence especially in those persons who have weak digestion. If some person finds drowsiness after its use, it would be better to take about 3 to 5 gm. of WS only in the evening.